Expozitia urmareste doua coordonate - cultul personalitatii lui Nicolae Ceausescu si distrugerea identitatii romanesti si a mentalitatii colective (uniformizarea societatii, demolarea bisericilor, distrugerea satelor). 2. the destruction of the Romanian identity and the community mentality (resulting in uniformity of the society, church demolition, destruction of the village and its community life). 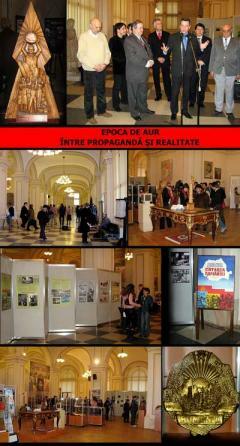 The exhibition includes paintings, decoration art (to illustrate the personality cult of the dictator), document-photographs as well as small reconstructions of the interior of houses in the communist period (to illustrate the state of the society during this period - the so called plans for "scientific nourishment", the plan for the rationalizations of the therm, electric and gas power, etc. ).